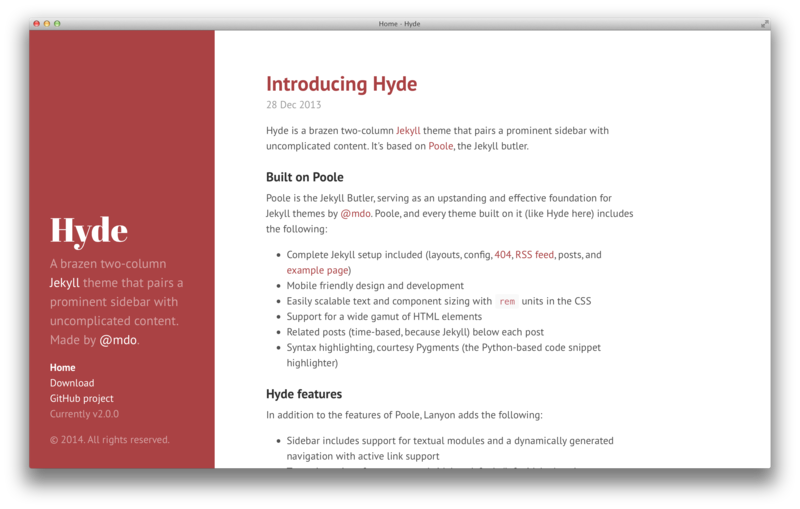 Hyde is a brazen two-column hugo theme based on the Jekyll theme of the same name. It pairs a prominent sidebar with uncomplicated content. Note: this is a fork I (Brendan Abolivier) made to adapt Hyde to my needs. More info below. Create a list of nav links in the sidebar by assigning "menu=main" in the front matter. 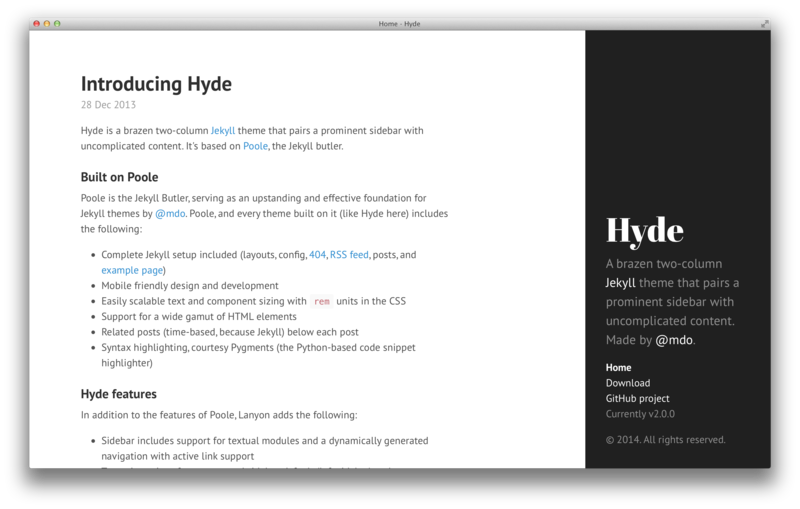 By default Hyde ships with a sidebar that affixes it's content to the bottom of the sidebar. You can optionally disabled this by removing the .sidebar-sticky class from the sidebar's .container. Sidebar content will then normally flow from top to bottom. 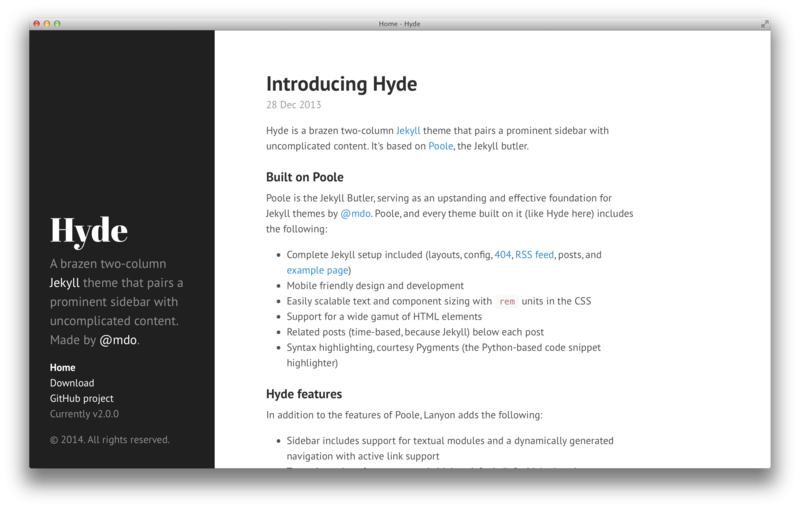 To create your own theme, look to the Themes section of included CSS file. Copy any existing theme (they're only a few lines of CSS), rename it, and change the provided colors. Adding support for posts' thumbnails, by supporting a thumbnail key in a post's front matter. Note that this value must not contain the https://myblog.tld/images part of the image's URL, which is added automatically before the key's value. Note that none of the configuration parameters I added are optional (mainly because I don't need them to be, but PRs are welcome!). A live demo is available on my blog. Of course, everything I didn't mess with belongs to the Hugo Hyde theme's authors and contributor.